Parts dumpers can be directly integrated with Feedall elevating or hopper feeders or can stand alone feeding loading tables or vibratory bowls. We offer 180º roll-over tub dumpers or hydraulic floor loaded tub dumpers. These dumpers can be loaded with a tow lift or a hand truck from the front or side. Feedall has successfully delivered tub dumpers of all shapes and sizes up to a 10,000 pound capacity. 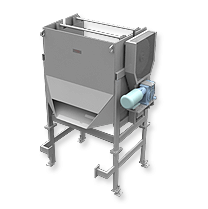 Metering hoppers can work independently or can be directly integrated with Feedall hopper feeders. This unit will meter parts onto loading tables, vibratory bowls, conveyor systems, etc. We supply 3000 and 6000lb metering hoppers with capacity up to 40 cubic feet. Metering hoppers add to the life of your Feedall parts feeder; all the violence from dumping parts is removed from your orienting parts feeder and placed onto the metering hopper. Dumps hose stem extrusion blanks from a tub into floor mounted bulk feeder. Feeds various hydraulic hose couplings and stems from a random loaded, floor mounted hopper. The part tubs are loaded into a hydraulic tub dumper and dumped into a vibratory metering hopper. The operator manually meters parts out of the vibratory hopper into a washer basket on a weight scale until the proper weight is met by utilizing a start/stop button. The discharge height of the vibratory hopper is 47” above the floor.